Resistance FTW! This baby balloon perfectly captures Drumpf’s affectionate nature and childlike wonder for all things! Can you imagine how furious the Commander in Cheeto was when he saw himself depicted as a human infant—the most fragile and beautiful creature on Earth? Sorry Mr. Trump, you might try to act like a big tough guy, but everyone knows that your inquisitive mind is learning and growing every day. All your wealth and power can’t hide your endless delight in learning about colors and shapes, a joyful discovery that reminds adults who see you at play that life is incredible and full of beauty, and thanks to the balloon the whole world knows it! This balloon no doubt has Trump shaking his tiny fingers, each one perfectly sculpted by God for grasping and touching the exciting new world all around him, in rage! 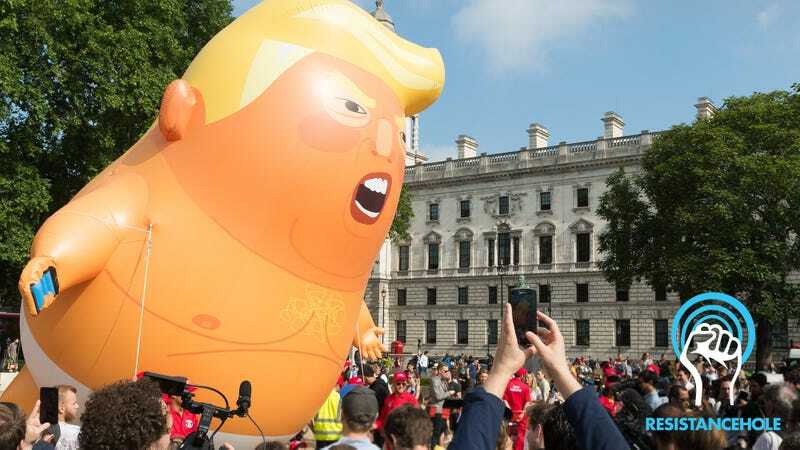 Protest organizers plan to bring the infant balloon to America, so it seems that Agent Orange’s temper tantrum isn’t going to end anytime soon—not until he sleeps soundly in his crib, dreaming sweet dreams about ducks and butterflies. Somebody change the president’s diaper because he’s still so helpless, so small, and so pure.